Gallia Academy junior Ian Hill clears an obstacle during the 300m hurdles event at the 2019 Gallia County Meet held at River Valley High School on April 9 in Bidwell, Ohio. PORTSMOUTH, Ohio — Still better than half of this difficult field. 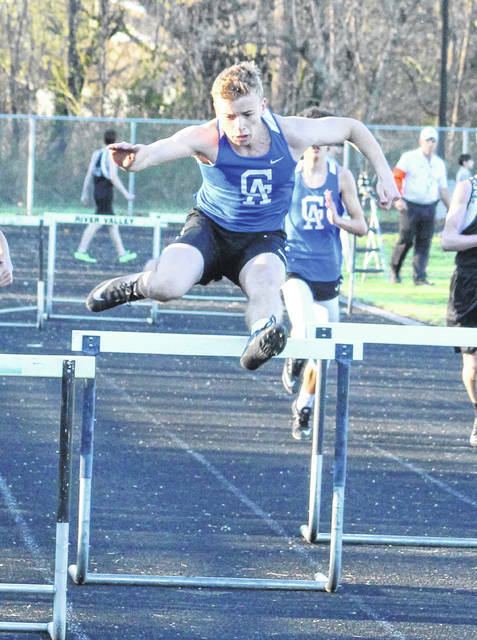 The Gallia Academy track and field teams came away with sixth place in their respective divisions, while the Portsmouth boys and Wheelersburg girls claimed top honors Friday at the 2019 Portsmouth Invitational in Scioto County. The Blue Devils had four top-four finishes and scored 57 points in the 14-team boys field, while the Blue Angels came away with six top-four efforts while scoring 49.5 points in the 13-team field. The Trojans won the boys meet with 116 points, with Rock Hill (100) and Northwest (81) rounding out the top three positions. The Lady Pirates captured the girls crown with 119.5 points, while Fairland (94) and Fisher Catholic (72) placed second and third. The boys secured the only event championship for GAHS as Ian Hill won the 300m hurdles event with a time of 42.47 seconds. Coen Duncan was also third overall in the pole vault with a cleared height of 10 feet, 6 inches. Logan Blouir finished fourth in the high jump (5-10) and Ryan Donovsky was fourth in the long jump with a leap of 19 feet, 3 inches. The Blue Angels landed a trio of runner-up finishes, with two of those coming in relays. Zoe Smith also secured second place in the 200m dash with a time of 27.44 seconds. The quartet of Smith, Peri Martin, Gretchen McConnell and Gabby McConnell posted a second place time of 1:54.11 in the 4×200. Martin, both McConnells and Alivia Lear were also the 4x100m runner-up squad with a mark of 54.69 seconds. Brooke Johnson placed third in the 800m run with a time of 2:38.03. Katie Queen was third in the pole vault with a cleared height of 7 feet, 6 inches. Johnson, Taylor Facemire, Brooke Hamilton and Pilar Ortego also finished fourth in the 4x800m relay with a time of 11:43.25. Visit baumspage.com for complete results of the 2019 Portsmouth Invitational hosted by Portsmouth High School on Friday.